My obsession with collard greens started with my recent discovery of the Oakland Ethiopian restaurant scene. My personal favorite is Addis because their food is delicious and the service is always very friendly. I also really enjoy the 10 minute walk to the restaurant from the Rockridge BART station because it goes through a very charming neighborhood filled with bathtub container gardens and artichoke plants. Most Ethiopian restaurants offer a vegetarian combination with a pretty standard set of dishes, served on a giant piece of spongy injera bread. There are two legume dishes; lentils cooked with spicy berbere seasoning and flavorful yellow split peas. The veggie combo usually has 3 vegetable dishes; a simple salad of lettuce dressed with olive oil and lemon juice, cooked potatoes and carrots, and of course, braised collard greens. 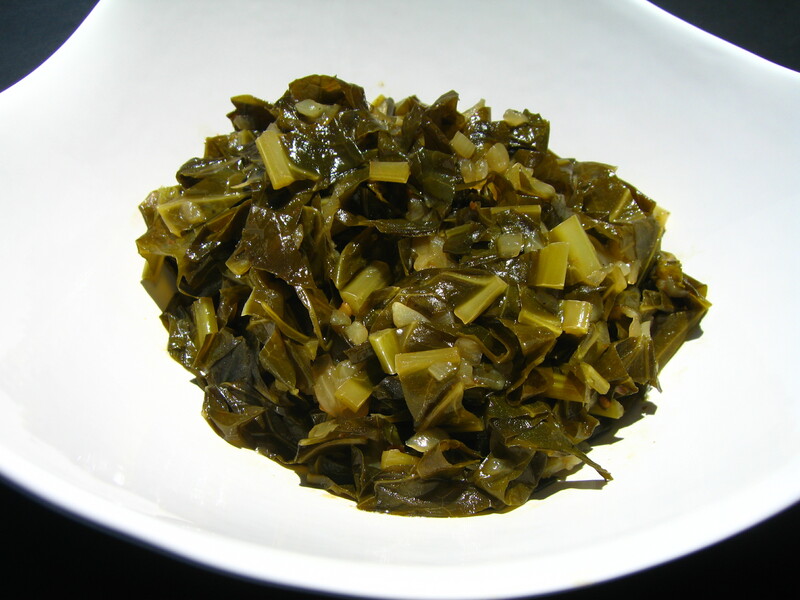 I’ve been experimenting with collards at home and the results have been delicious. I hope you’ll enjoy this recipe! To prepare greens: Cut in half length-wise. Working in small batches, stack leaves, roll lengthwise, and slice 1/2″ ribbons. Heat olive oil and Earth Balance in a large stock pot. Add onions and seasonings, cooking until onions begin to brown. De-glaze pot with mirin and add collards, broth, and additional seasonings to pot. Toss greens in liquid then cover pot with lid and cook over low heat for 1 hour – 90 minutes.